This guide shows you how to import static employee information, such as Name, Address, Date of Birth etc. into Payroll Manager. If you are starting to use Payroll Manager mid way through a tax year and have year to date figures for each employee then you can also import this information, which is then stored in the ‘Mid Year Start’ section of Payroll Manager. Please refer to our guide on Starting mid way through the year for further information. 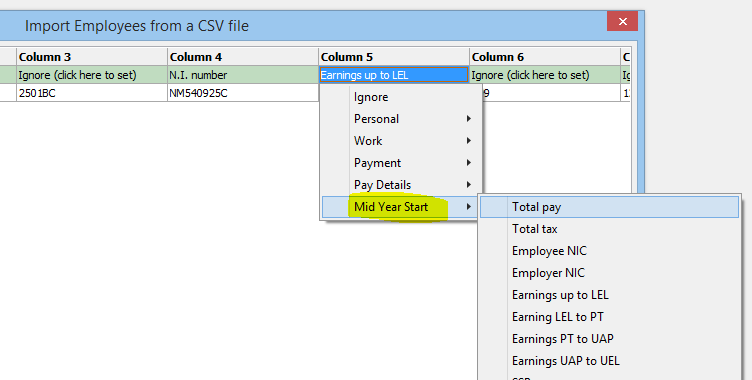 Payroll Manager is able to import employee details from CSV (Comma Separated Value) files. Many (but not all) software packages provide the facility to export data in CSV format, and will do so in different ways. For this reason we are not able to give exact instructions on how to export your data, but instead we have produced a list of fields that can be imported into Payroll Manager in CSV format. 2) – If you haven’t already done so you need to create a Payroll Manager data file in which to import your information. Click ‘File – New – Create a new blank file’ to create the new file. 3) – From the main menu in Payroll Manager click ‘Tools – Import Data – Import employees from a CSV file’. Browse to where your csv file is located, and double click the file. You will then see the ‘Import Employee from a CSV file’ screen. 4) – Work your way along the columns from left to right, ‘mapping’ each of your data fields to those within Payroll Manager (Please refer to the ‘List of data items’ which appear at the end of this guide to see which fields Payroll Manager is able to import). To map a particular field, click on ‘Ignore – (click here to set)’ in the relevant column and select the data type from the drop-down list that appears. You may have additional fields within your CSV file that Payroll Manager is not able to import – if so, leave these columns set to ‘Ignore’. IMPORTANT: Some Payroll Software (e.g.Sage) will have assigned a ‘PayrollID’ to each employee and reported this in FPS returns to HMRC. If so then you should ensure that you import this PayrollID into the ‘Works Number/Payroll ID’ field within Payroll Manager. If you are importing mid way through a tax year and wish to import year to date figures for each employee then you should map the relevant fields in the ‘Mid Year Start’ section. 5) – Each employee in your CSV file should be represented by a single row of data on the import screen. 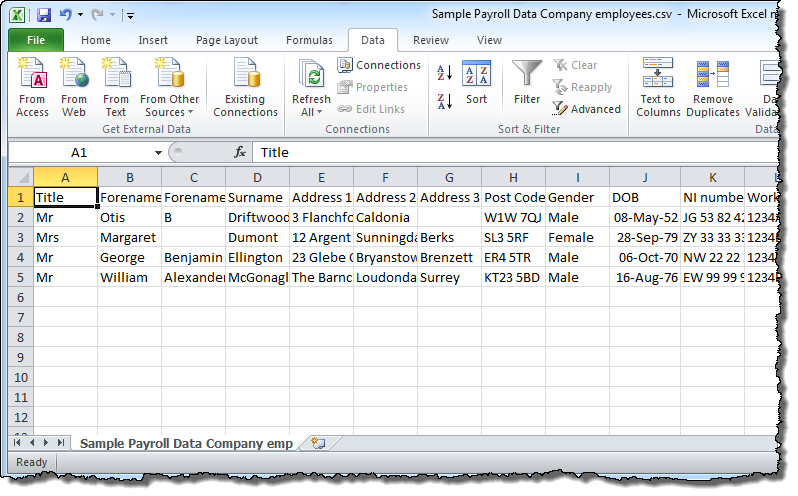 If your CSV file also contains column headings (such as Title, Forename1 etc. in the example below) then you need to tell Payroll Manager not to attempt to import this row of data by unchecking the ‘import’ box as shown. 6) – The bottom of the import screen shows any errors which will prevent importing, indicating that the format of some of your data does not match the format required by Payroll Manager. Any such data items are highlighted in red. You then need to choose whether or not to import this field by setting column header to ‘Ignore’, or to go back and edit you CSV file (using the ‘List of Data items’ as a reference) and then start the import process again. 7) – When there are no errors showing, you can click the ‘Import’ button to import your employee data. The following items can be imported from your CSV file into Payroll Manager. Please note that some fields are case-sensitive, whilst others (such as N.I Number) require exact data formats in order for the import to be successful. It is worth taking the time to validate your CSV data against the following criteria, editing as necessary before starting the import procedure. Tax code must be a valid tax code e.g 810L, BR, 0T etc. * Note: Your previous payroll software may have used a ‘PayrollID’ when submitting RTI returns. Sage software for example refers to the use of an ‘RTI Payroll ID’. In such cases you should import this PayrollID into the ‘Works Number / Payroll ID’ field in Moneysoft Payroll Manager.